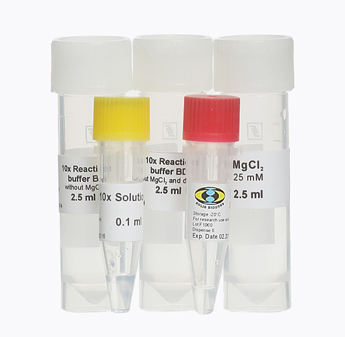 FIREPol® is a highly processive, thermostable DNA polymerase. Due to its genetic modifications FIREPol® has an enhanced stability at room temperature with no activity loss for up to 1 month. The enzyme has 5’→3’ polymerization-dependent exonuclease replacement activity but lacks 3’→ 5’ exonuclease activity. 01-01-00500 500 U 5 U/μl PDF PDF PDF 14.5 EUR Login to buy! 01-01-01000 1000 U 5 U/μl PDF PDF PDF 29 EUR Login to buy! 01-01-02000 2000 U 5 U/μl PDF PDF PDF 58 EUR Login to buy! - 10x Solution S Additive that facilitates amplification of difficult templates (e.g. GC-rich DNA templates). This solution should be used at a defined working concentration (1x, 2x or 3x solution). Solution S is NOT a reaction buffer and should be used ONLY IF non-specific amplifications occur. Shipping and temporary storage for up to 1 month at room temperature has no detrimental effects on the quality of FIREPol® DNA Polymerase. Antonius K, Aaltonen M, Uosukainen M, Hurme T.